The poll of 796 likely Maine voters, conducted July 26-28, finds Governor Paul LePage and Congressman Mike Michaud tied in the race for governor, with 41.4% and 42.6% of the vote, respectively. Eliot Cutler trails with 12.6%. Among men, LePage leads with a 6-point margin. It’s Michaud’s 7-point advantage among women that puts him one point ahead in the poll, well within the survey’s +/-3.47% statistical margin of error (at the 95% confidence level). 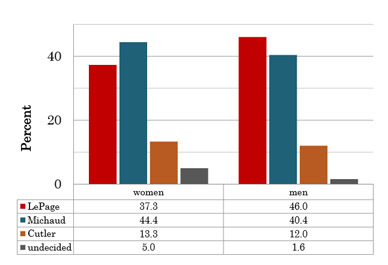 Women also represented 75% of undecided voters in the poll. While women have voted at a slightly higher rate than men in elections since the 1960s, they also have shown greater turnout variability, especially among younger and unmarried women. National research has shown that it isn’t necessarily policy areas traditionally thought of as “women’s issues” that get women to the polls, and this poll confirms that dynamic. The gender gap on issues like raising the minimum wage above $10 an hour (which 62.7% of Mainers support overall) and universal access to public pre-kindergarten (which 64.3% of Mainers support) is actually larger than on issues like whether private insurance plans should be required to cover the full cost of birth control (which 52.2% of all Mainers support). The poll also found strong support among all demographics for requiring companies to allow workers to earn paid sick days, accepting federal health care funds and promoting policies that allow Maine seniors to age with dignity in their own homes. Majorities of Mainers also reported that they had acted as family caregivers and had worked when they were sick because they couldn’t afford to take time off. Full results and methodological statement available here.